Bann Wheelers are hosting Round 2 of their Winter Trailquest Series from The 3 Oaks Bar & Restaurant in Aghadowey, on Sunday 8th November. Trailquests or Mountain Bike Orienteering is for anyone who loves being outdoors, likes a challenge, enjoys riding new areas and wants friendly low key events. You can take part if you have a bicycle, a helmet, and a team mate! Bann Wheelers are hosting Round 1 of their Winter Trailquest Series from Hecklers Bar, Ringsend, on Sunday 18th October. Three separate events are planned before Christmas. Teams (of pairs) can be male, female or mixed. After a successful introduction into Trailquests during the Winter of 2013/14 Bann Wheelers are aiming to host a Winter Series of 5 events for 2014/15. Dromara CC, who are by now past masters at organising Trailquests, have a real treat in store for you on Friday 27th December. They will be promoting their Three Peaks Trailquest taking in the 3 peaks of Dechomet, Crotlieve and Slieve Croob mountains with stunning views of County Down and beyond. 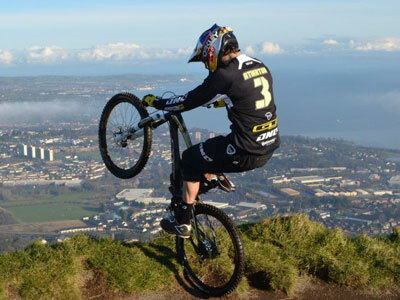 The Red Bull Foxhunt on Belfast’s Cave Hill took place at the weekend and attracted competitors and visitors from all over Ireland and beyond. Irish off road riders have consistently shown their talents both at home and abroad and this is due in no small measure to the top class mountain bike trails in Ireland. The fifth and final round of Dromara Cycling Club's Winter Trail Quests took place on Sunday 29 January 2012 from the Children's Cancer Care home at Shimna Valley in Bryansford. All proceeds from the five round series were being donated to this charity and it was fantastic to see another great turn out at this roun despite the wet conditions. Dromara CC have been running these mountain bike orienteering events for many years with this charity being the benefactor for over 5 years now. Round 3 of Dromara Cycling Club's Winter Trail Quests takes place on Tuesday 27 December 2011 from event headquarters at Brennan's Garage on the Newcastle Road near Seaforde.